US President Barack Obama has said he will visit Ireland in May. Speaking at the end of a meeting in the Oval Office with Taoiseach Enda Kenny, President Obama said he is looking forward to visiting Ireland. 'I wanted to say today that I intend to come to Ireland in May', he said, but the date of the visit has yet to be finalised. He said he is expecting to go not only to all the famous sites, but also to the place his great, great, great, great, great, grandfather hails from. He is 'excited' about going to Moneygall, he added. Enda Kenny said the visit was a vote of confidence in the Irish people at a time of difficulty. The Taoiseach said he could assure the president of a rapturous welcome, and said if he wanted to play golf he would be happy to join him. President Obama said he had heard Mr Kenny was a good golfer, so he himself would have to practice. The Taoiseach learned of the president's decision only 15 minutes before the announcement was made, it is understood. The US president and the Taoiseach also discussed how Ireland will bounce back from economic turmoil. Mr Obama said he was sure the US would continue to co-operate with and to give practical assistance where possible. 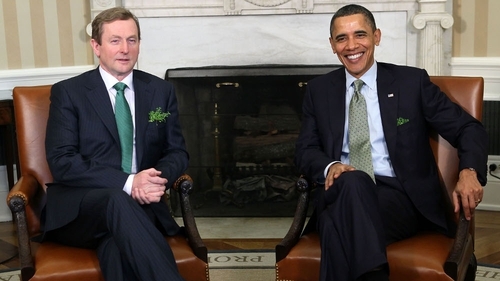 Taoiseach Enda Kenny later presented Mr Obama with the traditional bowl of shamrock. Meanwhile, in Moneygall, word of the visit has been well-received and although generations have passed, blood ties with the president still remain. Records have revealed that Mr Obama's great great great great grandfather was a shoemaker in Moneygall, Co Offaly and his son, Fulmuth Kearney, left for New York in 1850. Henry Healy a local in Moneygall has traced his roots to the Obama-Kearney lineage and said that the president can be assured of a fond welcome. Mr Healy, who travelled to Washington for the president's inauguration at the invitation of Irish-Americans, said the ancestral home is still standing, as is the schoolhouse and church. Enda Kenny's day in Washington began with breakfast with Vice President Joe Biden. Later, in a speech on Capitol Hill, Mr Kenny, speaking on behalf of all the people of Ireland said 'thank you' for America’s role in bringing peace to Ireland. Last night, Mr Kenny addressed around 1,000 guests at the annual gala dinner of the American Ireland Fund. Mr Kenny said Ireland was ‘far from finished’, and that the election marked a new dawn for the country. The American Ireland Fund is aiming to raise $100m for Irish charities by the end of 2013. The Taoiseach also held a 30-minute meeting with US Treasury Secretary Timothy Geithner in Washington yesterday evening. The two men discussed the global economic situation. Mr Kenny repeated his Government's determination to conclusively address the reduction of the budget deficit and reform of the banking system. Sinn Féin President Gerry Adams, TD, has welcomed President Obama's decision to visit Ireland in May.